We believe that your local HVAC (Heating, Ventilation and Air Conditioning) professional knows best about your specific indoor comfort needs and indoor air quality solutions. When they recommend a Goodman brand product, rest assured that you and your family will soon be receiving great indoor comfort, at a refreshingly affordable price. Independent HVAC contractors have access to a wide variety of heating and air conditioning brands. And they have to stand behind the brand that they recommend 100%, or suffer the consequences of unhappy customers. Most homeowners have no idea of the brand name of their central heating and cooling system that is installed in their home. It’s a purchase many homeowners make just once or twice in their life — typically on a very hot or very cold day. On the other hand, your local HVAC dealer recommends and installs Goodman brand heating and cooling systems every day! 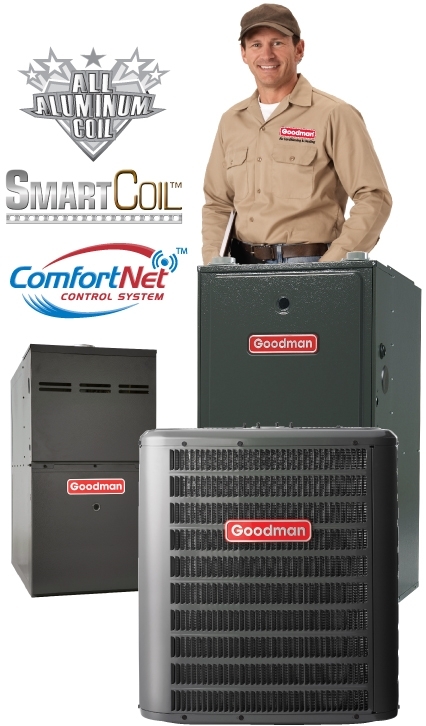 There’s a good reason why thousands of the nation’s HVAC professionals recommend the Goodman brand. Dealers are completely comfortable with Goodman brand products that will keep their customers satisfied and enhance their own reputation. Goodman brand manufacturing facilities are ISO 9001-certified, an independent standard accepted worldwide as the benchmark for quality manufacturing and management processes, and ISO 14001-certified, an international environmental certification. high-performance commercial heating and cooling products and systems that provide comfortable indoor environments for businesses, restaurants and stores coast to coast. So it’s okay if you don’t know about the Goodman® brand. Thousands of the country’s most experienced heating and air conditioning professionals trust it to perform each and every day, year after year. Their recommendations have been keeping millions and millions of North American households comfortable since day one.